A community profile is a snapshot of your local community at any point in time. These profiles are used primarily to attract investment and/or develop a strategy for future developments in a community. Building a community profile is one of the main functions of economic developers. If you are new to the role of economic development, here are the steps you need to take to build up your community profile. 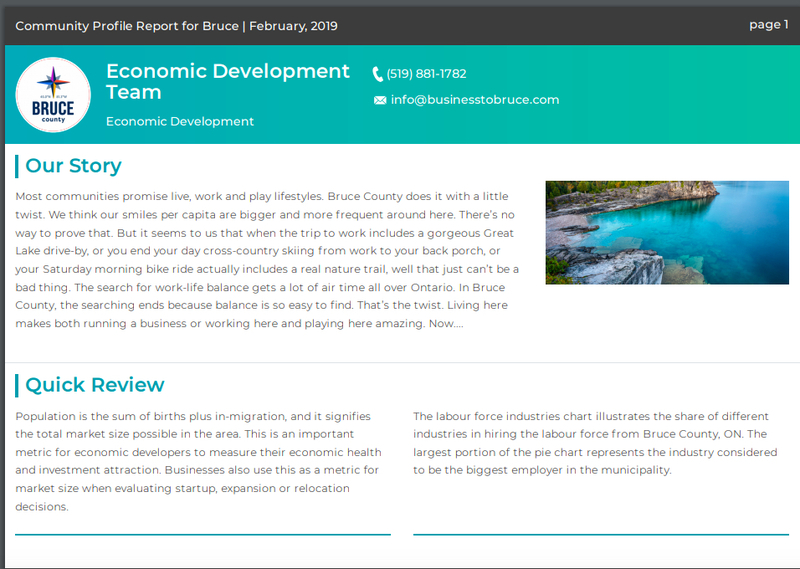 Many community profiles usually have standard demographics data, but depending on the goals of your profile, you may want to add information about business activity, labour force, taxation and quality of life. Once you determine the datasets that you will need, you are going to need to find data sources that help you build out the community profile. Most of the time you will be using Statistics Canada, but depending on the datasets you want on your community profile, you will also be using data from Environment Canada and OMAFRA. Townfolio uses technology to get automated data updates from Environment Canada and Statistics Canada for all profiles. After finding the best data sources for your community, you will need to build our the datasets for your community and add chart descriptions to help explain the data to your stakeholders and prospective investors. You may want to talk to key stakeholders about the areas of the community which they consider assets in the local area. These assets may include schools, major companies and/or public buildings which are major pillars of the local community. Adding these assets to your community profile provide a basis for understanding the personal and commercial impacts of activity in the community. Townfolio allows users to add custom charts, key industries and unique investment incentives to their community profile in the setup process. Adding a map to your community profile allows you to communicate the relationship between your community and the surrounding area. This would help stakeholders ensure that their investments are in a position to get extra resources as needed if your community falls short in certain areas. Feel free to book a free appointment with our Customer Success Team to review your community profile. After ensuring that your community profile is strong, it is important to release your profile. Many people release the profile by adding a downloadable PDF link to their website while others may have some printed copies in-house to hand to investors. Townfolio offers the ability to embed your community profile in your website with the change to download the datasets as excel sheets, PDF Community Profiles and JPG Charts. After a few years, the data may be out of date. It is important for you to re-build your community profile every few years so that your profile can earn the trust of its users. Townfolio is automatically updated every month to ensure that the data is accurate and up to date.